The second picture book authored by Milikapiti School children is being printed. 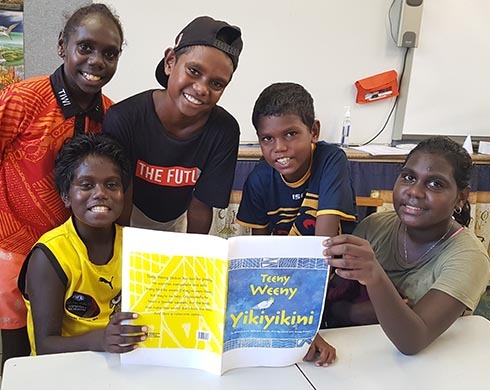 Created in association with the Indigenous Literacy Foundation, the Tiwi Island students worked to produce Teeny Weeny Yikiyikini by developing the concept, narrative and illustrations. The book describes the search by a cockatoo for his lost family, and follows the publication in 2015 of the community acclaimed hungry crocodile story, No Way Yirrikipay! Principal Kathryn Leo said: “When the book was being developed there were lots of cockatoos in the community, and they were getting into the mango trees. The book took eight students from years 3 to 6 about nine months to produce. Ms Leo added: “Producing these books gives students an opportunity to reflect on who they are, where they come from, and share a part of their home with others. “ILF program coordinator Cindy Manfong arranged several visits by Indigenous author and illustrator Greg Dreise, who workshopped with the students and guided their ideas. “Elder Nina Black assisted with the language used in the book, and supported the children to write the book with Greg.